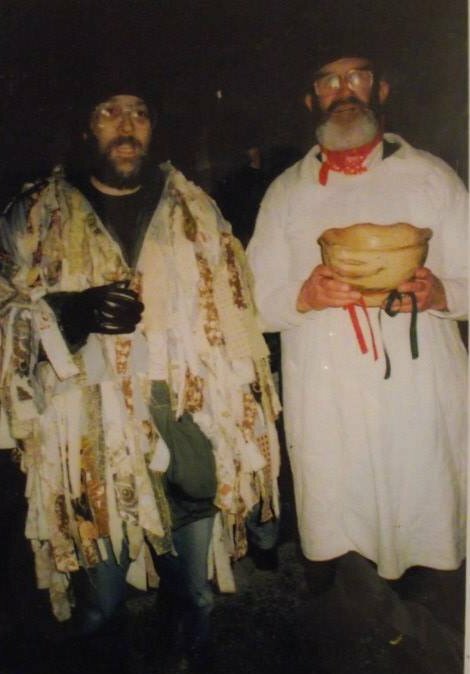 18 years, and still as popular as ever, the Wick Court Wassail has become a great regular event in our diary. Arriving early Bill took us through the house to show us a photograph of himself and Eric in their younger guise when this event was still in its infancy – as someone said, no wonder Bill knows the words so well! Returning to the courtyard, and after a quick scrabble to change into costume, we performed our last mummers play of the season. We had Greeks playing Turks – providing humour with his dying dagger, heckling from the crowd – with a valiant repost from the Soldier Bold (or was that a bold repost from the valiant soldier?) and a new old woman with an old toothache (six years before she found it and seven since!). The treasury man was in great demand and we collected several pieces of paper as well as coins of the realm – which we duly donated to Wick Court. Our reward was great praise (best play yet! ), hot soup and bread, mulled cider and an invitation to do it all again next year. Our thanks to the generosity of all who attended the wassail and put money into the hat. After all the merriment and food outside we retired indoors to warm our feet on the underfloor heating, and to enjoy the songs and tunes that follow such festivities where’er we go. 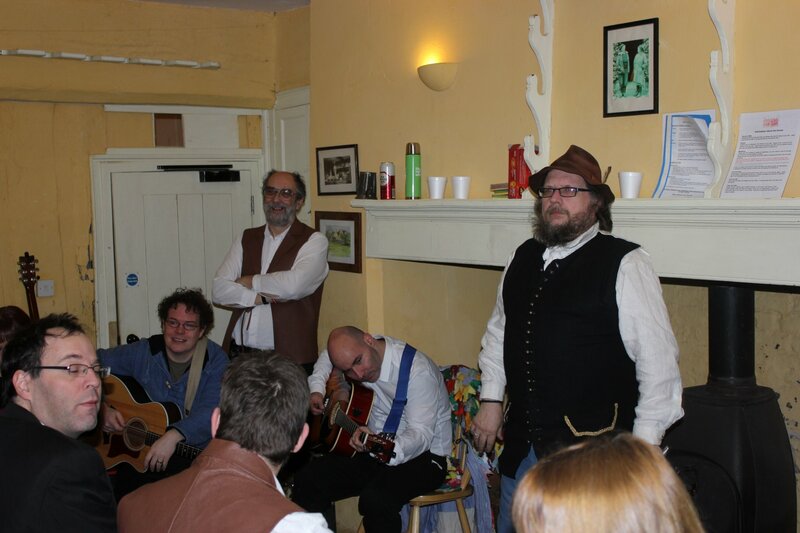 So ended another great season of wassailing; music, song, cider and fine company. May the orchards be fruitful again this year. Pray don’t let the wassailers stay on the cold stones. Waes Hail! This entry was posted in Wassail and tagged Lassington Oak, LOMM, Morris, mumming, wassail, Wick Court. Bookmark the permalink.